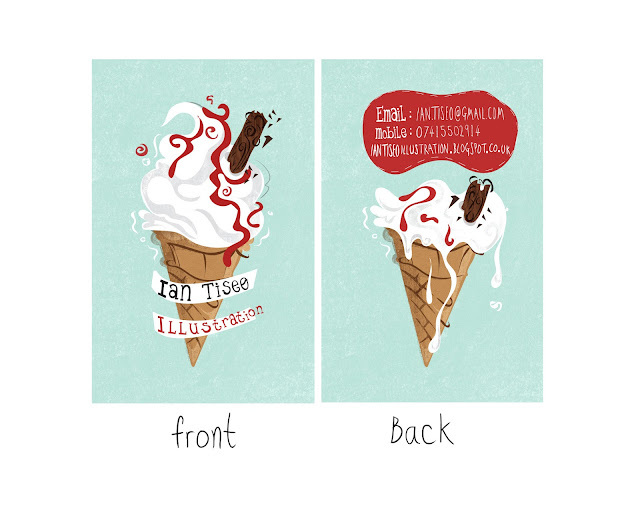 Ian Tiseo Illustration: I'm a professional, so make me some business cards! I'm a professional, so make me some business cards! Wow, it's been a long time since I last updated here! I guess I've been a bit busy, but I shall rectify that with a surge of new images and ramblings. Seeing as I think I'm an illustrator, I felt I should get myself some cute little business cards made up. After searching for what felt like an age, I found a site that I was happy with, which was MOO ( http://uk.moo.com/ ). Nice and easy to figure out and put my designs on, plus it had 20% discount for students. I haven't taken enough advantage of student discounts since returning to uni so it made sense using it this time. I've ordered myself 50, and because I'm a cheap skate I will be picking them up from MOO Headquarters in Shoreditch instead of paying for shipping. Plus that means I don't have to rely on a postman!